What if photons actually have mass? All known forms of matter have mass. The bosons carrying the weak nuclear force are massive. The Higgs boson famously is massive. With that knowledge, it’s reasonable to ask: what if photons have mass too? Photons are particles of light, which means they are countable objects carrying measurable amounts of electromagnetic energy. As such, they move at the speed of light and are massless in most of our models. (For more on why that’s important, see my earlier post on the meaning of mass.) Photons are described by quantum electrodynamics (QED), one of the most successful theories we have, to the point where any deviation from its predictions must happen at the edge of measurability. However, it’s still possible that photons have mass, and therefore (ironically) don’t move at the speed of light. That’s not quite as crazy as it sounds. As you’d expect, though, even a tiny photon mass would have important consequences for theory and experiment. Let’s list a few of them, then consider each in more detail. While there’s still a special speed, it would no longer be the speed light travels. Technically, that would mean you could travel at the same speed a photon travels, though as a practical matter that would likely be unfeasible. The electrical force binding atoms together would have a characteristic length scale, determined by the photon mass. Large photon mass means the force acts only over short distances, while a small mass would lead to influences over larger distance. This is what we see with the particles carrying the weak force (memorably known as the W and Z gauge bosons): they have very large masses, and the weak force consequently extends over very short distances. A massless photon, by contrast, leads to an inverse-square law, meaning that the electrical force technically extends to infinity. Massive photons could be unstable, decaying into other particles. Again, that’s not as crazy as it seems: if the half-life of a photon is large enough, their decays might not be noticeable over the lifetime of the Universe. The spoiler (for those who don’t want to read to the end) is that photon mass must be really tiny, and based on our knowledge of radiation from the early Universe that puts a really strong constraint on the photon lifetime: photons can’t decay before about 100 million times the current age of the cosmos. According to relativity, massless particles travel at the speed of light, so you can never bring them to rest. However, even if photons possess mass, it doesn’t mean it will be easy to accomplish that. Think of neutrinos, which definitely have mass; despite years of effort and excellent precision experiments, we still don’t have any mass measurements of any of the three neutrino flavors. Both neutrinos and photons are electrically neutral particles, which eliminates several easy options for bringing them to a stop in the lab. No experiment thus far has distinguished a difference in the speed between different types of photons, from radio waves to gamma rays, which would be expected if photons are massive. Of course, other than the spurious OPERA results in 2011, nobody has measured a difference in the speed of neutrinos from the speed of light, so that’s likely a poor way to determine whether photons have mass or not. Physicists have considered massive photons for decades, starting with Alexandru Proca in 1930, who wrote down the modified form of Maxwell’s equations of electromagnetism to allow them. Later, Hideki Yukawa used Proca’s work as an inspiration for his Nobel Prize-winning research into nuclear forces. Yukawa showed that a short-ranged force like that holding atomic nuclei together were the result of massive particles mediating the interaction, and calculated the mass of the pion from that principle. Yukawa’s equation for this interaction also describes a massive photon. The appendix below has the equation for those interested, but suffice to say that the mass of the particle — whether a pion, massive photon, or other subatomic beastie — provides a natural range for the force it carries. More massive particles have a short range, while lighter particles are longer-ranged, with the force from massless particles technically extending to infinity (though weakening with the square of the distance). Photons are the mediators of the electromagnetic force, which in turn dictates the structure of atoms, molecules, and solids. That means we have some immediate tests of how massive a photon can be, by measuring the force between two electric charges. A 1971 paper using those methods reported an upper limit of about 10-14 eV, an incredibly small mass. For comparison, an electron’s mass is about 500,000 eV, and the current limit on the maximum neutrino mass is about 0.1 eV. If you want a thorough review of these and other experiments, see this 2010 review article. The upshot is that even a ridiculously tiny photon mass would have a measurable effect. As we push to ever more sensitive tests, we’ll either find what that mass is, or increase our confidence that photons are probably massless. Even if we’re conservative in our upper limits, any deviation from the behavior we expect from massless photons is incredibly small. Yet, it’s still not good enough. We want to know if photons are truly massless, and that’s a very hard question to answer. The reason this topic is on my mind was a new paper by Julian Heeck in Physical Review Letters last week (freely available online), asking a pair of related questions: if photons have mass, how long is their expected lifetime? and what can photons decay into? Something with mass that small can’t decay into very many things we know about. (A low-mass particle can’t decay spontaneously into a higher-mass particle, since that violates conservation of energy.) In fact, there’s only one possible candidate: the lowest-mass neutrino, assuming its mass ends up being smaller than the photon mass limit. That seems unlikely to me, which leaves us with new particle possibilities. Physicists are inventive animals, so suffice to say there are theoretical possibilities, including axions and other more exotic particles. However, with such a long minimum photon lifetime, we won’t be able to test these possibilities very easily. In addition to the range of the electromagnetic force, photon mass also affects the thermal or blackbody spectrum of a hot object. Humans are approximately blackbodies: our metabolic processes make us glow in the infrared. Stars are much closer to being ideal blackbodies, but the Universe as a whole is nearly perfect. If photons have mass, then that mass would slightly change the blackbody spectrum of the cosmic microwave background (CMB), the light left over from when the Universe became transparent 380,000 years after the Big Bang. 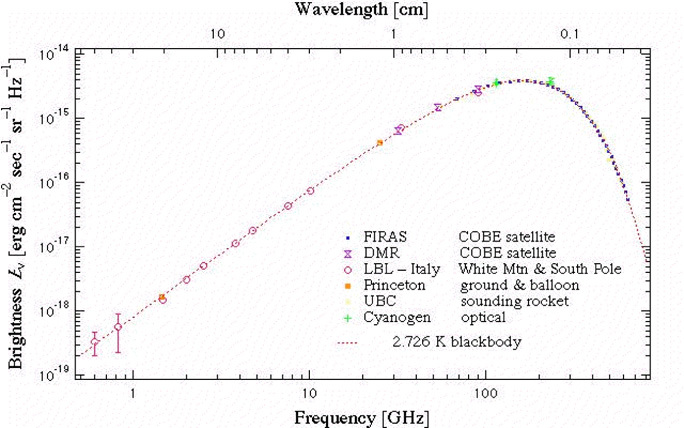 We don’t see the CMB as it was billions of years ago, but its relic today. If a significant number of photons decayed over the last 13.8 billion years, then there should be imperfections in the CMB spectrum measured by observatories such as Planck. Since the CMB spectrum is very good, as the figure above shows, Heeck found that photon mass can be no larger than 3×10-6 eV from that alone. That constraint is larger than other experiments, but it’s a nice result anyway. However, the CMB also places a stringent limit on the lifetime of a photon: the half-life should be no shorter than about 3 years in the photon’s own reference frame. According to relativity, objects moving close to the speed of light relative to us will appear to have longer lifetimes, based on how fast they’re moving. Using the maximum allowed mass of a photon from experiment, the measured energy of CMB photons, and the excellence of the CMB spectrum. Heeck estimated the half-life of photons in our reference frame should be about 1018 years, or on the order of 100 million times the current age of the Universe. So, if someone asks you if photons can decay, the answer is maybe. For the sake of experiments and most theory, we’re still perfectly justified in assuming a massless, stable photon, and we can make light of any other suggestion. If photons have mass, the Yukawa force law between two electric charges q and Q separated by a distance r is where includes the photon mass mγ, the speed of light c, and Planck’s constant ħ. This equation corresponds exactly to the ordinary Coulomb force law when the photon mass is zero. However, even for small photon mass, these equations will nearly be the same, since a small factor of μ in the Yukawa force law will hardly make any difference experimentally. On the other hand, a large mass will impose a sharp cutoff in the strength of the force, since the exponentially decaying term in the equation will throttle it. That’s how the Yukawa force (with the appropriate changes to represent nuclear forces instead of electromagnetic) predicts the short range of the nuclear force and the value of the pion mass.